You don't need to hire a personal chef (as if!) or resign yourself to starvation to get bikini-ready. All you need is a blender. "Blending is one of the quickest, easiest ways to prep healthy foods, especially fresh fruits and veggies," says FITNESS advisory board member Harley Pasternak, trainer, nutrition expert, and author of the new book The Body Reset Diet. 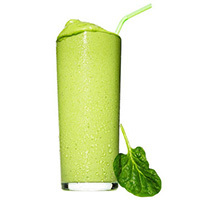 Get his favorite smoothie recipes plus details on how they can kick-start your metabolism and keep it fired up for good. Pasternak favors milk — 1 percent or nonfat — because it's rich in vitamin D and calcium, which can help your body break down fat. But nondairy milks, like soy and almond, are fine too, he says, as is flavored water. Getting protein at every meal helps you maintain lean muscle mass, which means you burn more calories throughout the day. Your best bets: plain nonfat yogurt, silken tofu, or unflavored protein powder. 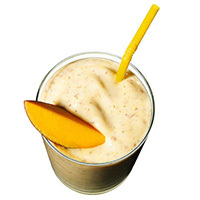 These give you energy, make your smoothie satisfying, and help your body absorb vitamins. Use up to two tablespoons of an ingredient that contains the good — that is, monounsaturated — kind, like avocado, seeds, or nuts. Any fruit will do, but raspberries and blueberries deliver the most fiber and the least amount of sugar. As for veggies, spinach and cucumber have the mildest, easiest-to-mask flavors. You know your diet should include a variety of colors. Consider these recipes your ticket to that pot of gold at the end of the rainbow: a bikini body! 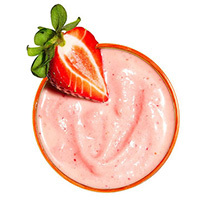 For each, put the yogurt in first, then add the solid ingredients and blend until smooth. Depending on how thick you like your smoothies — and how powerful your blender or food processor is — you may need to thin these out with a little liquid, such as nonfat milk. Amanda Seyfried, Hilary Duff, and Katy Perry all credit their hot bods to trainer and nutrition expert Harley Pasternak. Here's his tailored-to-you advice. Q. My metabolism is definitely slowing. How can I rev it up? A. Graze, don't gorge. Studies show that smaller, more frequent meals shift your metabolism into high gear, which is why my plan has you eating five times a day. Q. Is there a healthy way to lose weight this week? A. In the long term, moderation is key. But if people don't see results quickly, they tend to give up. So I suggest having three smoothies and two snacks a day for five days, then two smoothies, a solid meal, and two snacks a day for five more days. You'll lose weight right away because the smoothies have fewer calories than your average meal, but they're so filling, you won't feel deprived. Then for the last five days, you taper off to just one smoothie a day, which is something I suggest keeping up for life. Q. What's so great about smoothies? A. For one thing, they're incredibly convenient: You just throw everything into a blender and press a button, which eliminates any excuse for not eating right. For another, they're high in volume, so they take up a lot of space in your stomach. Best of all, the blades of the blender slice through the cell walls of all those fruits and veggies, making their nutrients — like fiber, protein, and healthy fats — easier for your body to absorb. And the more fiber you get, the fuller you feel, which means you can eat less and still be just as satisfied.